Much, too much has been said and written about power in organizations, and about leadership. Most of what has been said and written about the subject is utter nonsense. And we know it. Many experts in the field of organizational management and development claim that developing a robust theory of leadership is an illusive, even utopian, undertaking. Others do not seem to care much about theory at all and just repeat the same old prejudices and misconceptions... over, and over, and over. About heroic leaders and their followers, on one side, and the need for hierarchical control. Or about the miraculous end of hirarchy, and the outright abolition of power, on the other side. Well, both sides are wrong. A little more than 100 years after Frederick W. Taylor´s pioneering and often misinterpreted work on management science, we should finally end the quackery around organizational power and leadership. And turn to theory and insights that have long been available to us, but that have been widely ignored by the business community as much as by academics. McGregor was right, of course. We have, however, only just started with what he predicted more than fifty years ago. A theory of organizational leadership of the kind McGregor theorized about will certainly have to deal with, and explain power within organizations. 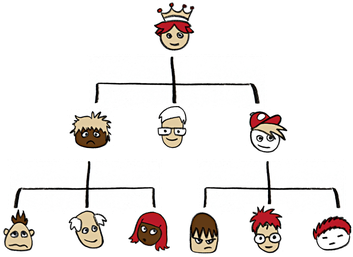 Hierarchy = power within Formal Structure = formal power. Formal Structure: The domain of Hierarchy, or formal power. So much about that. Formal Structure is needed for compliance, that´s why every organization, large or small, old or young, has one. But Formal Structure is also usually over-emphasized: We make too much of it! Even though we all know that too much formal power, or hierarchy, has serious downsides. The question is: Why the downsides? And the answer to that is that Formal Structure is just one of three structures within any organization. If you accentuate Formal Structure, or over-use it, then the other two structures or what happens in them, suffer. The second structure is Informal Structure. Informal Structure became more popularly known and talked about with the rise of social networks. But it had been a well-known phenomenon to the social sciences long before that. 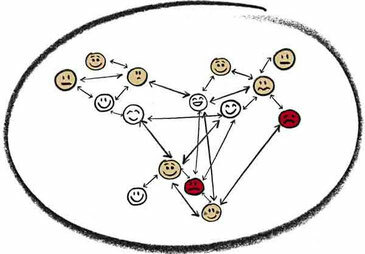 Informal Structure can be mapped as “clouds” of interconnected individuals, with varying numbers of links to others – placing individuals either in central or more peripheral positions in the cloud. Informal Structure is neither good, nor bad. Informal Structure is. And of course there is power in the informal. We call this power Influence. Influence = power within Informal Structure = informal power. Informal Structure: The domain of Influence, or informal power. It should be mentioned here that the two structures, and powers we looked at so far, are interdependent. So if a CEO scares the crap out of people by mentioning that he intends to hire McKinsey for a restructuring exercise, he is probably intervening in both. Both structures will duly react: In the formal structure, most managers will probably take some steps to secure their turfs. But most of the reaction is likely to happen within informal structure: politics, gossip, coalition-building, intrigue - these are also phenomena arising from informal structure. They can be incredibly powerful, even wrecking any corporate restructuring effort. And especially those executed by consultants and managers who intervene almost exclusively on Formal Structure. One of the few large companies that has developed mastery in positively acting on and engaging with its Informal Structure is Google. Now let´s turn to the least-understood of the three structures any organization has. Ironically, it is the structure in which the work is done. From which performance and success can arise. Because look at it: neither success nor performance can be produced through Formal or Informal Structure, because these just carry the compliance dimension and the social dimensions of the organization. For actual work, or value creation, organizations possess a third structure: Value Creation Structure. And from this structure, again, arises a particular kind of power. We call this power Reputation. Reputation = power within Value Creation Structure = professional power. Value Creation Structure: The domain of Reputation, or professional power. Value Creation is networked. It flows from the inside out - always. From center, to periphery, to market (for more on this distinction read my book Organize for Complexity). You have seen professional power, or Reputation happening. It´s when people have a work problem they cannot solve on their own, and they turn to someone else, asking: "Who knows about this?" or "Who is the expert in this matter who I can ask about it?" They are looking for mastery, and they can find it by hooking up to the network of power that is Value Creation Structure. Sadly, Value Creation Structure is rarely consciously designed in organizations, and most of the time it is not even being worked upon systematically – with a few notable exceptions. One large company that has developed true mastery in empowering and leading through its Value Creation Structure, by turning it into its dominant structure, is Toyota. Value Creation Structures can be mapped as networks of cells, which contain functionally integrated teams, and which are interrelated by value flow, pay, and communication relationships. 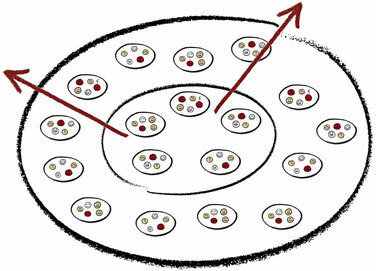 In the structure, any cells either creates value for other network cells or for the outside market. Cells, or teams, respond to market pull, not hierarchy. Reputation (arising from Value Creation Structure)." The three kinds of power, and structures, are interdependent, not independent." Hierarchy is necessary for (and only for!) building compliance. It is not networked. As formal power, It is not a form of leadership - but of management. In the presence of formal power, leadership is actually quite impossible to happen. Influence is necessary for social density and connection. It is networked. It is a form of leadership. Reputation is necessary for value creation. It is networked, as well. It is the second form of leadership. All organizations know three kinds of power, and two forms of leadership. I don't even understand how I finished up here, but I assumed this post was once great. I do not recognise who you are but definitely you are going to a well-known blogger if you aren't already. Cheers! Great site. A lot of helpful info here. I am sending it to several friends ans additionally sharing in delicious. And certainly, thank you in your sweat! Wow, that's what I was exploring for, what a material! existing here at this website, thanks admin of this web site. What's up, everything is going perfectly here and ofcourse every one is sharing data, that's truly excellent, keep up writing. Hey there, You've done a great job. I'll definitely digg it and personally recommend to my friends. I'm confident they will be benefited from this site. Hiya! I know this is kinda off topic but I'd figured I'd ask. Would you be interested in trading links or maybe guest writing a blog post or vice-versa? My website goes over a lot of the same subjects as yours and I believe we could greatly benefit from each other. If you are interested feel free to shoot me an e-mail. I look forward to hearing from you! Awesome blog by the way! I am really impressed with your writing skills and also with the layout on your blog. Is this a paid theme or did you modify it yourself? Anyway keep up the excellent quality writing, it is rare to see a great blog like this one nowadays. Can I simply say what a comfort to discover an individual who really knows what they are talking about over the internet. You certainly realize how to bring a problem to light and make it important. More people ought to read this and understand this side of your story. I was surprised you're not more popular given that you most certainly have the gift. I visited multiple sites however the audio quality for audio songs existing at this website is truly fabulous. What's up to every body, it's my first go to see of this blog; this weblog carries remarkable and genuinely fine material designed for readers. Link exchange is nothing else except it is only placing the other person's blog link on your page at suitable place and other person will also do same in favor of you. I have read so many articles about the blogger lovers except this piece of writing is genuinely a nice piece of writing, keep it up. It's amazing to pay a quick visit this site and reading the views of all friends regarding this piece of writing, while I am also eager of getting familiarity. Excellent blog! Do you have any suggestions for aspiring writers? I'm planning to start my own site soon but I'm a little lost on everything. Would you propose starting with a free platform like Wordpress or go for a paid option? There are so many options out there that I'm completely overwhelmed .. Any tips? Thanks! It's a shame you don't have a donate button! I'd most certainly donate to this brilliant blog! I suppose for now i'll settle for bookmarking and adding your RSS feed to my Google account. I look forward to brand new updates and will talk about this blog with my Facebook group. Chat soon! I was recommended this website by my cousin. I am not sure whether this publish is written via him as no one else realize such distinct about my problem. You're incredible! Thanks! Thanks for another wonderful article. The place else may anybody get that kind of info in such an ideal way of writing? I have a presentation next week, and I am on the search for such information. We should learn some basic tips regarding leadership and goals. Leadership is an essential part of our life and we need to develop it in various ways while following different ingredients. Most probably, people with positive attitude and strong personality are blessed with good leadership skills. Due to lack of leadership skills, we are facing different types of problems such as; lack of confidence, lack of creativity, lack of innovative ideas, and lack of strong personality. Here this article also describes some essential facts about leadership and how to achieve the leadership goals. Thanks for such a wonderful article with useful information. Thanks for sharing the information. i really enjoyed your blog article and always read your blog.